I know many of you are probably familiar with the app MakeItMine which allows you to easily customize your Carrier Logo and Banner (that is the area where the time is located on the Status Bar). One cool thing that I just found is that you can add emoticons to your Status Bar using MIM (MakeItMine). 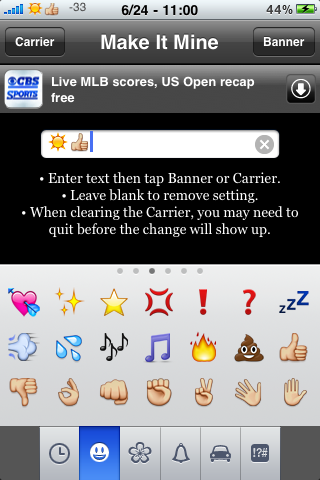 When you open the app, just enter the emoticons like you would your custom text (see note below). Simple and easy.